As if chemotherapy isn’t hard enough on its own, patients who undergo this course of cancer treatment also have the added struggle of maintaining a nutritious diet. Now these patients have access to a nutritional supplement specifically designed to give them the nutrients they need when they find it hard to keep down their meals. 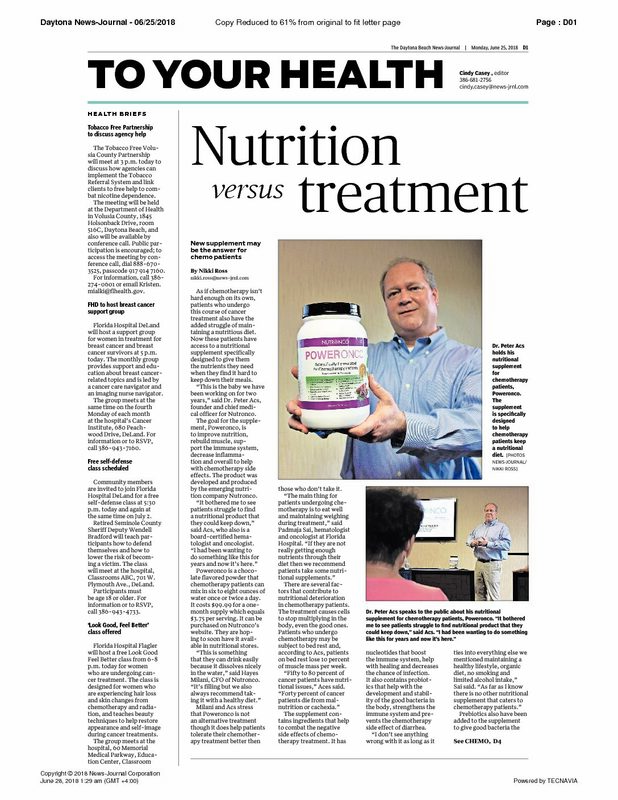 “This is the baby we have been working on for two years,” said Dr. Peter Acs, founder and chief medical officer for Nutronco. The goal for the supplement, Poweronco, is to improve nutrition, rebuild muscle, support the immune system, decrease inflammation and overall to help with chemotherapy side effects. The product was developed and produced by the emerging nutrition company Nutronco. “It bothered me to see patients struggle to find a nutritional product that they could keep down,” said Acs, who also is a board-certified hematologist and oncologist. Poweronco is a chocolate flavored powder that chemotherapy patients can mix in six to eight ounces of water once or twice a day. It costs $99.99 for a one month supply which equals $3.75 per serving. It can be purchased on Nutronco’s website. They are hoping to soon have it available in nutritional stores. “This is something that they can drink easily because it dissolves nicely in the water,” said Hayes Milani, CFO of Nutronco. Milani and Acs stress that Poweronco is not an alternative treatment though it does help patients tolerate their chemotherapy treatment better then those who don’t take it. There are several factors that contribute to nutritional deterioration in chemotherapy patients. The treatment causes cells to stop multiplying in the body, even the good ones. Patients who undergo chemotherapy may be subject to bed rest and, according to Acs, patients on bed rest lose 10 percent of muscle mass per week. “Fifty to 80 percent of cancer patients have nutritional issues,” Aces said. The supplement contains ingredients that help to combat the negative side effects of chemotherapy treatment. It has nucleotides that boost the immune system, help with healing and decreases the chance of infection. It also contains probiotics that help with the development and stability of the good bacteria in the body, strengthens the immune system and prevents the chemotherapy side effect of diarrhea. Prebiotics also have been added to the supplement to give good bacteria the surface to grow. Ginger and other ingredients are also there to reduce nausea. It also includes protein. “Many oncologists will be skeptical,” said Dr. Michael Epitropoulos, oncologist, chiropractic and natural medicine physician. For information on Nutronco and their products, visit nutronco.com. To contact Dr. Peter Acs, call 352-672-4403. To contact Hayes Milani, call 352-278-2526. To contact Dr. Michael Epitropoulos, call 386-274-2520.